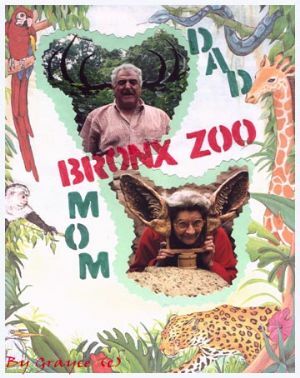 hen I was a child growing up in the Bronx, my family made frequent trips to The BronxZoo. It was always an adventure, and the happiest times I ever spent with my Dad were in that park. We would take the number twenty bus to Fordham Road and Southern Boulevard. Before we entered we would purchase a brown paper bag of hot roasted peanuts from the vendor stationed just up from the bus stop. Once armed with our enticements, we'd proceed to the entrance. Dad would pay our fee, push my brothers and sister and me through the tall turnstile and then follow us. Without exception, he always "got stuck" in the huge rotating iron-gate and pleaded with us to help him get free. After he succeeded in terrifying us he always miraculously broke loose and we would gleefully cheer. Raucously, we kids would then dart ahead to "the rock." A mammoth boulder jutted out of the pavement and we would climb and clamber over it until we triumphantly reached its pinnacle, which was all of three feet high. Having that ritual done, each of us filled our tiny hands with peanuts to feed the squirrels. Tap, tap, tap, we would knock on the ground to get their attention. We'd drop the treats just in front of us and remain very, very still while they gingerly approached. They would grab their gifts and cleverly maneuver the shell to get at the nut inside. We were enthralled at the entire performance. Next we happily skipped ahead to the deer herd enclosed in their fenced yard. We were convinced they belonged to that roly-poly, jolly guy who dressed in red. Of course we searched diligently for the most famous reindeer of all with the red nose. The only one to spot him for certain was (you guessed it) Dad. It was a thrill to get so close and to know the herd lived in the Bronx. Just a short run ahead was "the giant bird cage." It was very exciting to enter their world as a myriad of feathered creatures freely flew over our heads. What fascinated me also was the variety of birdcalls. Until this day I whistle to birds, mimicking their calls as I learned to do then. Some responded and came closer to examine us in wonder. One exhibit after another entertained us beyond our expectations. As many times as we visited we were never bored. There was always a new discovery and Dad enhanced it with his own shenanigans. He would skip along exhorting us to join him as he sang "Here we go gathering nuts and hay, nuts and hay, nuts and hay." We merrily skipped along singing, laughing, and eagerly anticipating the next stop of our tour. We always visited the toucans. They were among Dad's favorites. He told us that he had once carved his initials into the beak of one of them. I never did find it but I believed it for a long, long time. In fact I still find myself inspecting them prudently. When we reached the big, noisy cat house we were awestruck. Dad lived dangerously. He would roll up a newspaper and glide it across the bars tantalizing the lions or tigers until the cats shredded it. At that time all the felines were housed in one building in bare concrete and steel cages. Although Dad played perilously, I think two things were accomplished (in spite of him). First, he demonstrated to us the power of the animals, and secondly he provided some diversion to the poor beasts that had little more to do than pace to and fro out of bored frustration. Throughout the day Dad would show us the paper and remind us what those big cats were capable of. In the Ape House, where there were exotic primates from seemingly every corner of the planet, there lived a clan of Mandrills. Not only did I find them mesmerizing, but they apparently perceived me the same way. When I was in their presence the red-faced patriarch would become agitated and pounce on the glass toward me. He would calm down when I exited, then resume his aggressive behavior when I returned, leaving me open to crude remarks from my older siblings. Visits to the Zoo continue to be a family destination to this day. Dad died three years ago. The last time I spent time alone with him was at the zoo. We reminisced and marveled at the wonderful changes that have occurred. It is now more appropriately called "The Wildlife Conservation Park." Long gone are the prisons that once housed the animals. For the most part they have been replaced by naturalistic habitats that are designed to provide comfortable dwelling places for the residents and visually appealing views for visitors. It has come a long way since it's inception in 1899. Today more of the park's 265 acres are used as diverse environments to the animal's advantage. They are grouped with other species in areas according to the regions they are indigenous to. For example the lions share an open plains area with other species that are also natives of the African Savannah such as gazelles and storks. A deep moat that blends unobtrusively into the landscape separates them from each other. Nearby are other African species such as giraffes, okapis, meercats, and more all in the great outdoor neighborhood replicating their native lands. A few years ago a snowstorm caused the old aviary to collapse. Fortunately loss of bird life was minimal. A new structure has been erected and provides a beautiful seaside community of feathered creatures from the Pacific Coast of South America. 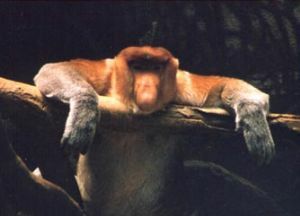 This wonderful zoological park we call the Bronx Zoo has truly changed drastically for the better since I was a child. It serves to raise people's consciousness about endangered and threatened species rather than to simply entertain. When my grandson Christopher saw a display of the frivolous products made by ivory from slaughtered elephants, then examined the mammoth pachyderms live, he quickly came to their defense, recognizing the need to protect them. Countless children have come to understand many of the perils that earth's creatures face because of education programs provided at "our Bronx Zoo." This is a heritage worth preserving for many generations to come. This essay is dedicated to my Dad, Dominick Pedulla.